EU General Data Protection Regulation (GDPR) comes into force on May 25, 2018. It is one of the tightest data privacy regulations in decades. It brings a huge impact to Canadian Businesses who offer any products or services to EU customers. The potential fine is up to €20 Million or 4% of business global annual revenue. GDPR will significantly change how we are running the businesses today, including areas like business process, customer relationship, data governance, data privacy, vendor management, cybersecurity, breach reporting, etc. 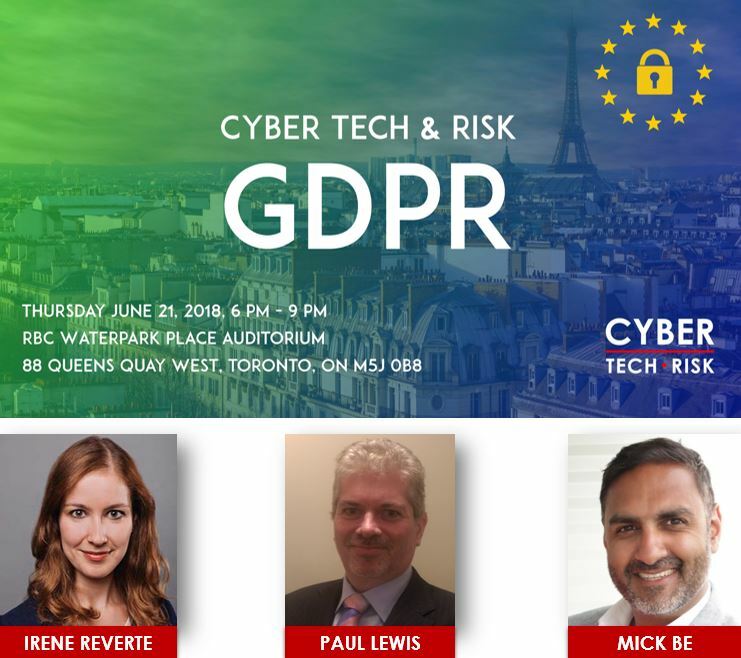 Cyber Tech & Risk is proud to bring you the high-demand event of “GDPR (General Data Protection Regulation)“. It will help you understand if and how GDPR impacts your business, and what is the right way to build a suitable GDPR program for you! 3. Case Study (Mini-Panel Discussion) – What should a Tech Startup Company Do with GDPR? Mick B, CEO & Founder, IAmI Authentications Inc.